What's the "scoop" about us - Les and Lynda ? 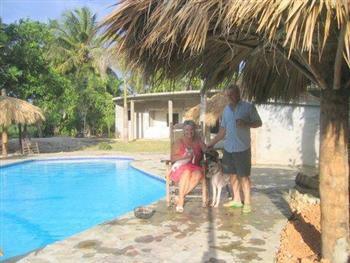 We're Canadian baby boomer expats, vacationing in the DR for 7 years before deciding to live here full time. We lived in Canada most of our lives and spent some time in Texas too, before our DR move. Texas living was a valuable orientation to living in the tropics. Cockroaches would freak me out a lot more if I hadn't first encountered them in America. The comfort and convenience of living outside in the tropics, offsets any downside of dealing with bugs that live there too. 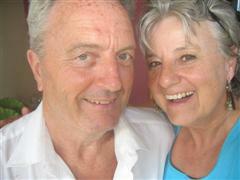 We are both "Gemini twins", and have been married since 1969. We have 2 amazing sons, 2 daughters-in-law, 2 granddaughters, a grandson, and 2"grand-dogs". They are all very powerful magnets, pulling us back "home" for visits. Our older son + daughter-in-law, with their daughter + son + dog, live in Canada. Our younger son + daughter-in-law + granddaughter live in Mexico with their dog, to pursue their passion for wedding photography. Sometimes they all feel very far away. Holidays and special family occasions are a challenge, because that's when they'd come over for "dinner with Les and Lynda." Great family memories + fun times! 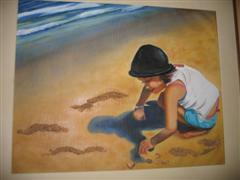 Artwork is my passion! 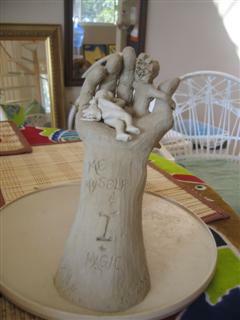 I discovered clay sculpting in Texas and instantly fell in LUV! Here, I've started painting - one day a week - with an artist friend who comes over. We set up in the open-air center of the house, and "work" (more like play, actually) in the comfort of the tropic breeze. We're not the only ones inspired by our surroundings. 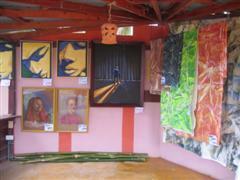 Our area has numerous very talented artisans, whose talents are showcased by the amazing artwork they create. 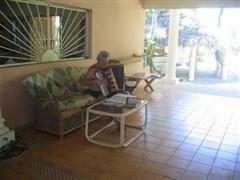 Les has a great singing voice, plays guitar and accordion, writes songs and LUVs to perform with the grandkids. They went busking in Calgary and earned their lunch money in under an hour. 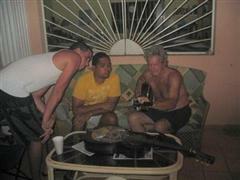 His dream is to have a song he's written, performed on radio or TV. A true Gemini, Les's flair for landscaping has him forever putzing in the gardens. 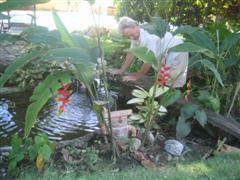 He even built a fish pond, spanned by a wooden plank bridge, complete with its' own troll. Guess that would make it a "troll-bridge" ha! We never knew what "pet-people" we are, till we moved here. At first, we got a dog for security, and a cat for the inevitable "rat patrol". Since then, we've acquired a second dog and 3 cats (found abandoned + rescued). Our whole gang, (each of us adapting to our new home together), forged a bond that morphed us into a "parent n pet family". They entertain us for hours, showing their individual personalities with amusing antics. Both of us have learned a lot about ourselves since we came here. For example, our patience has expanded beyond any limits we had before, by dealing with third world conditions. We have a much better understanding of how to "roll with the punches" and save our sanity by not "sweating the small stuff". Friends of our family back home, ask them for the latest story about us, Les and Lynda, living la vida loca on location, beachside in Cabarete, Dominican Republic, treasure isle of the Caribbean. Better Than Gold: is Retirement in the Dominican Republic For You ? Have we piqued your curiosity?!?!? You can contact us directly for more info via email below. We're happy to hear from you + assist in any way.